History of the Gufeld Cup. 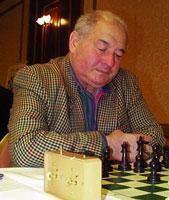 Russian Grand Master J. Eduard Gufeld visited Perth in 1986. He stayed with Willetton Sports Club Chess Secretary, Vince Soto-Olivo, father of Gina Soto-Olivo who went on to become W.A. Junior Champion and then Australian Girls Champion. After a simultaneous exhibition at the Willetton Sports Club, Eduard's offer to provide a perpetual trophy to the club was gratefully accepted. This was to be the Gufeld Cup, played over three days of Easter in a seven round open tournament. After disbandment of the Willetton Club the trophy was competed for as a W.A. Grand Prix event over the Easter weekend at the Perth Chess Centre. The 2018 Gufeld Cup was held on the weekend of 8th and 9th September. The field of 14 participants was relatively small, but also relatively strong. Congratulations to the winner, Tim Hare (5.0/6). Second was Andrew Hardegen (4.5/6). WFM Kathryn Hardegen and David Ellis finished equal 3rd (4.0/6). Rating prizes (Under 1770 ACF) were won by Alan Wolstencroft (1st: 3.5/6) and David Barry (2nd: 3.0/6). Thanks go to David Ellis for organising the event and performing the role of chief arbiter capably whilst playing. Thanks also go to Alan Wolstencroft for providing CAWA tea and coffee, and to Southern Suburbs Chess Club for hosting the event. Report provided by Andrew Hardegen.